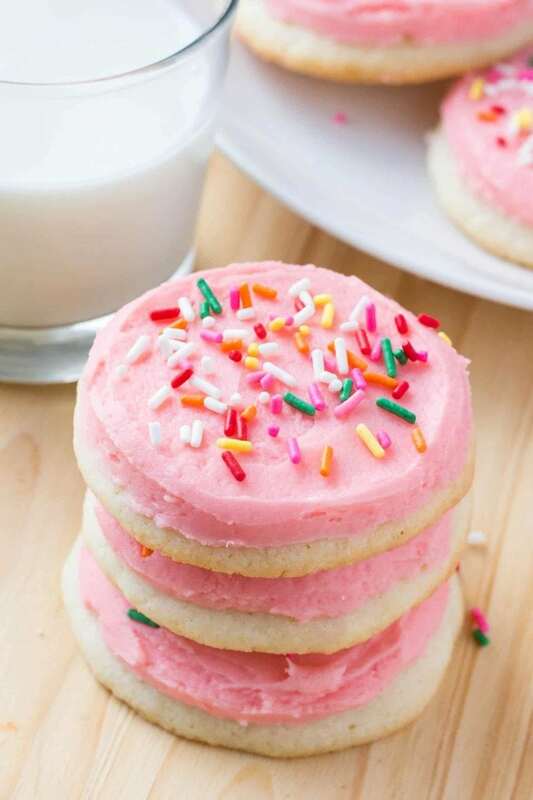 Make Lofthouse sugar cookies at home! These sugar cookies have a delicious buttery vanilla flavor, delicate crumb, and melt in your mouth. Then they’re topped with creamy frosting & tons of sprinkles. 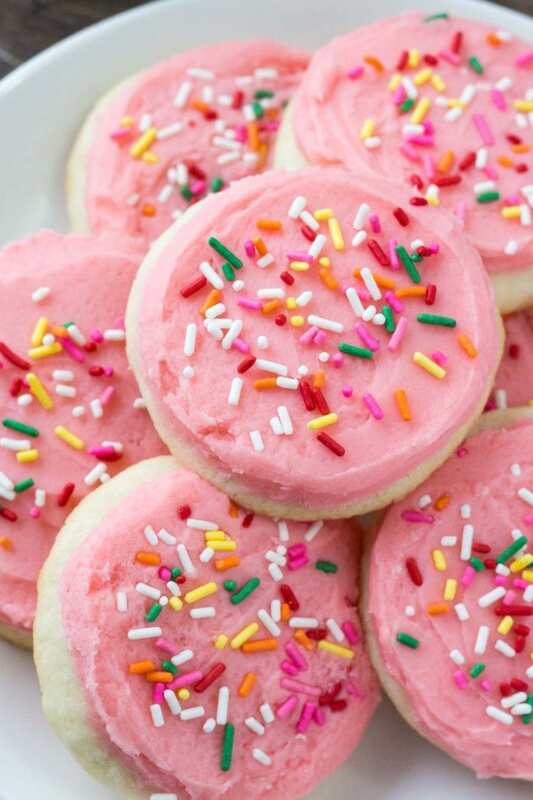 I absolutely love Lofthouse sugar cookies. I love the pink frosting and sprinkles. And there’s nothing better than pillowy soft sugar cookies topped with a thick layer of creamy buttercream. So I decided to find the perfect copycat Lofthouse sugar cookie recipe. These are just as thick, soft, and have the most delicious delicate cookie crumb. Then they’re topped with a thick layer of buttercream frosting. You’re going to love them. For the perfect sugar cookies, there’s a few key ingredients and steps. You can find the detailed recipe below, but I’m going to highlight why we’re using certain ingredients. First we’re using a combination of butter and shortening. Butter for flavor and shortening makes the cookies extra soft. Then we’re adding 1 large egg plus 1 extra egg white. Eggs add tenderness. For this recipe we’re using cake flour. Cake flour makes the cookies have a delicate texture that melts in your mouth. Finally, I like to add a little almond extract to these sugar cookies for even more flavor. It’s seriously delicious. Make sure to chill the dough so the cookies stay thick. Then form them into balls and flatten slightly by pressing them down with the bottom of a cup. You can make regular sized cookies by forming them into balls about 2 tablespoons in size, or make jumbo cookies with a large cookie scoop (about 3.5 tablespoons in size each). Then after the cookies have cooled, it’s time to get on with the frosting. Simple, creamy, vanilla buttercream. What could be more delicious? 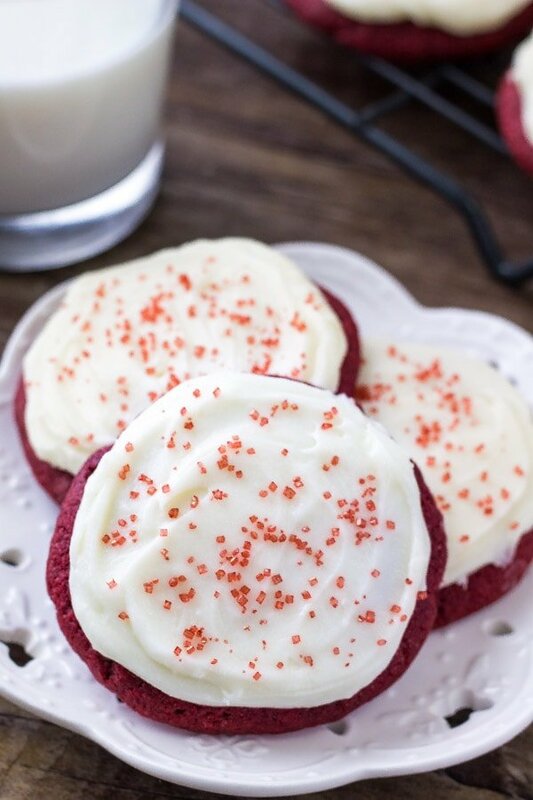 I like to play around with the frosting and sprinkles for different holidays – like red and green for Christmas or pink and red for Valentine’s Day. 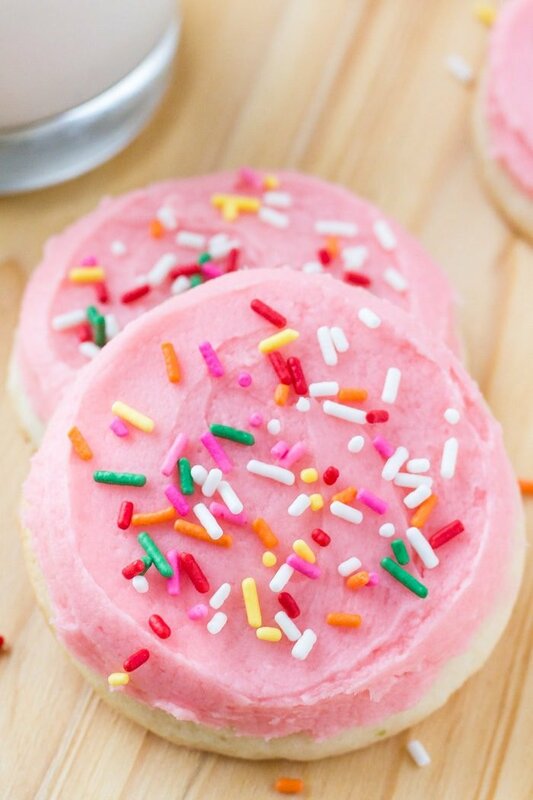 But no matter what day of the year you make these Lofthouse sugar cookies – they’ll disappear quickly! 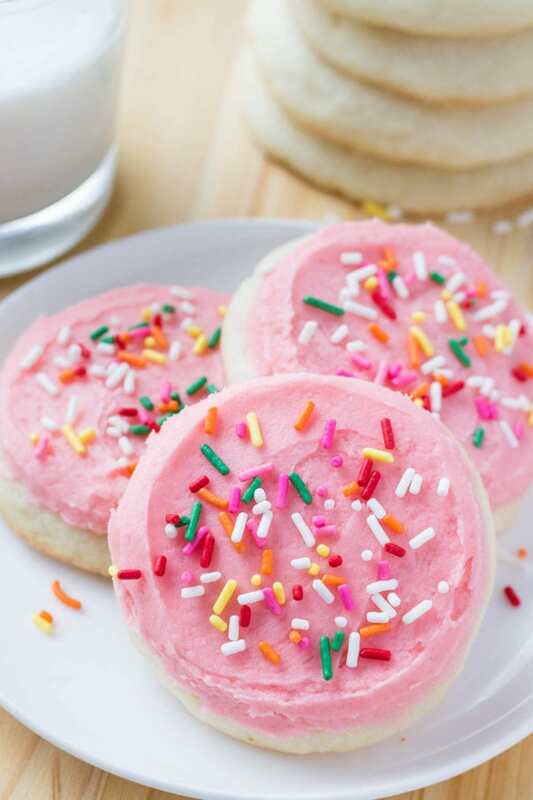 Make Lofthouse sugar cookies at home! These sugar cookies have a delicious buttery vanilla flavor, delicate crumb, and melt in your mouth. Then they're topped with creamy frosting & tons of sprinkles. In a large bowl sift together the cake flour, baking powder and salt. In a separate bowl beat together the butter, shortening and sugar until fluffy. Then beat in the egg, egg white, vanilla extract and almond extract. With the mixer on low beat in the flour mixture about 1/2 at a time. Cover the bowl with plastic wrap and refrigerate for at least 3 hours or overnight. Form the dough into balls about 2 tablespoons in size and place 2 inches apart on a baking sheet. Press the tops down slightly using the bottom of a cup dipped in flour. Bake for 9-11 minutes, or until the tops are set. In a large bowl beat the butter and shortening until fluffy. Beat in the powdered sugar about 1 cup at a time, then beat in the milk/cream about 1 tablespoon at a time, adding a little more powdered sugar as necessary. Then mix in the food coloring (I used about 5-6 drops of red). Frost cooled cookies with a flat knife and decorate with sprinkles. 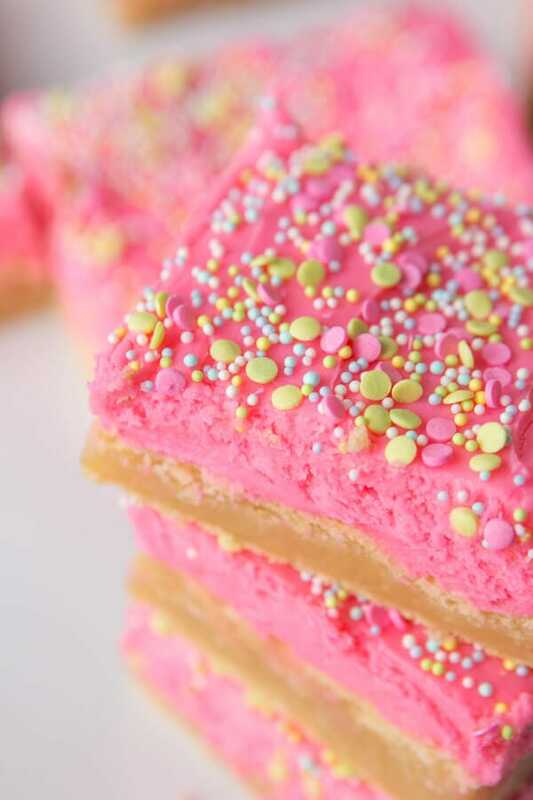 These sugar cookie bars are soft, buttery & completely delicious!